In the back parking lot of Middlebury’s Marble Works District, Costello's Market is dressed up with string lights and pine wreaths ribboned in Santa Claus red. Christmas music hums from inside — Darlene Love's “Christmas (Baby Please Come Home)” and a smattering of Frank Sinatra. The market was shuttered for two weeks around Thanksgiving for the owners’ annual trip to Italy. For me as a Midd local, it was a bleak 14 days of unquelled cravings. Now, with a fire newly flickering in the market’s wood-bellied stove, the place offers double relief: a Costello’s fix at a "dime"-worthy price. Hamilton, meanwhile, is tucked in the kitchen, pulling fresh lasagna through the pasta wheel or turning tortellini by hand on a long wooden countertop. Behind the deli case are inky black olives bathing in their brine; fresh orbs of house-made mozzarella; chunks of imported cured meats next to local mascarpone and burrata; deep fried arancini, marinated cucumbers, stuffed peppers and slabs of lasagna Bolognese ready to be warmed for dinner. A neighboring display holds iced trays of fresh seafood delivered daily from Boston by Black River Produce. There are bay scallops and wild Gulf shrimp; sleek fillets of striped bass, haddock, tilapia and snapper; salmon steaks and yellowfin tuna. Nearby, two standing coolers house take-away items such as chicken stock, local gelati and house-made ravioli with seasonal fillings. A shelf of Hamilton’s sauces carries containers of porcini mushroom sauce, Bolognese and sugo di Amatriciana, ready partners for any of the dried and fresh pastas stacked along the market’s walls. Shall we talk about pasta? 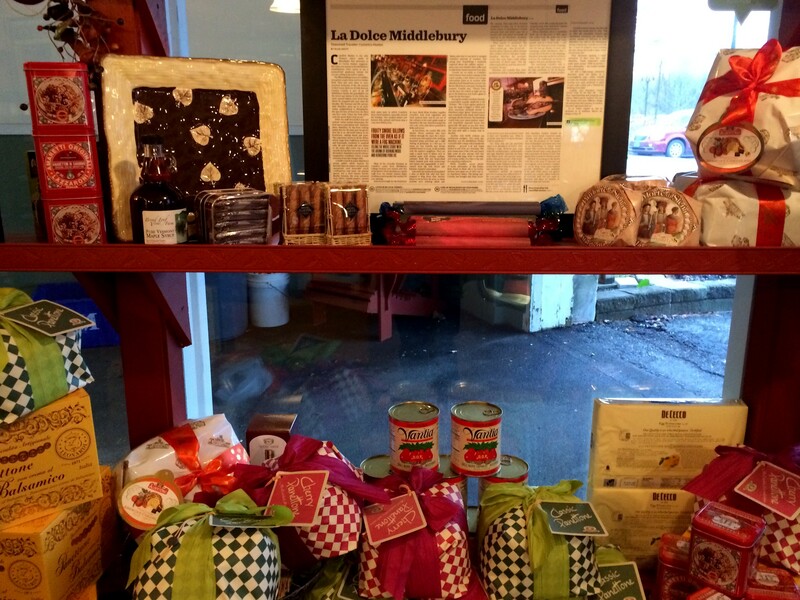 There are old reliables like De Cecco among the market's stock, but the imported dried varieties make excellent treats and holiday gifts (hint, hint). One counter near the beverage cooler carries enormous tubes of paccheri, saffron-kissed tagliolini, egg fettucini and — for the cooks, the Italians or the ambitious — Neapolitan tipo “00” flour for the pasta wheel. For a late 3 p.m. lunch, I meander around Costello’s with the rarity of having the place to myself. I chat with Costello and Hamilton about their recent trip, and ask them to tell me about those oven-bronzed wedges of Ligurian focaccia. 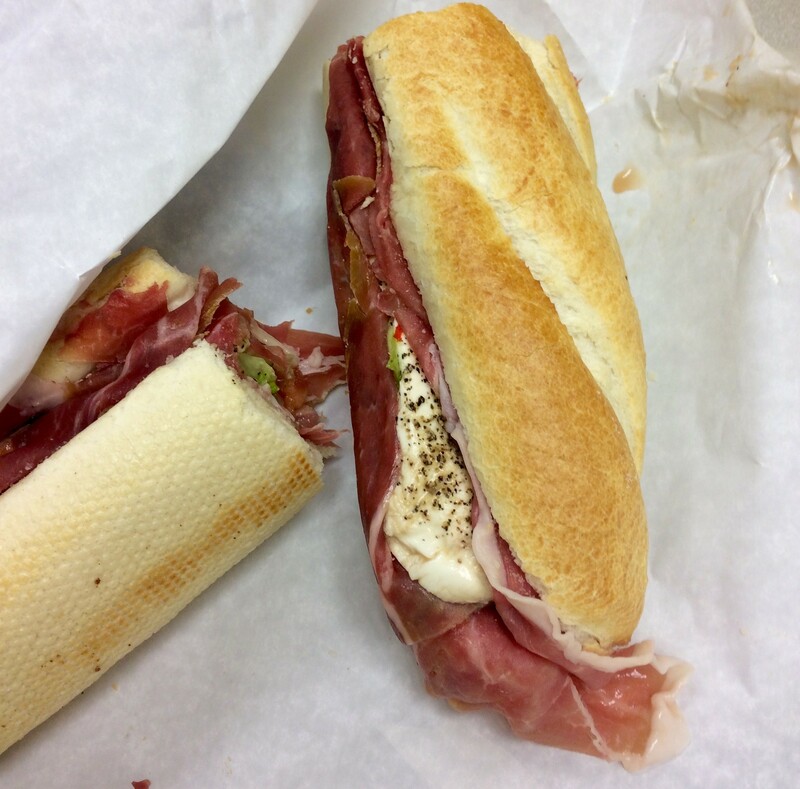 I opt to stick with the classics and order my go-to, the "Soprano": Hamilton's homemade sub roll packed with imported prosciutto, fresh mozzarella, lettuce, tomato and seasoned olive oil. It’s $11.95 for a large, $9.95 for a small and, unless I’ve just hiked Camel’s Hump, I go with a small; it’s still more than half a foot long. The market has no indoor seating, but it’s mild enough this afternoon to take my fare outside to the picnic tables overlooking the Otter Creek waterfall.